Dutch Bangla Bank HSC Scholarship 2018. DBBL Scholarhip for HSC Equivalent passed students. 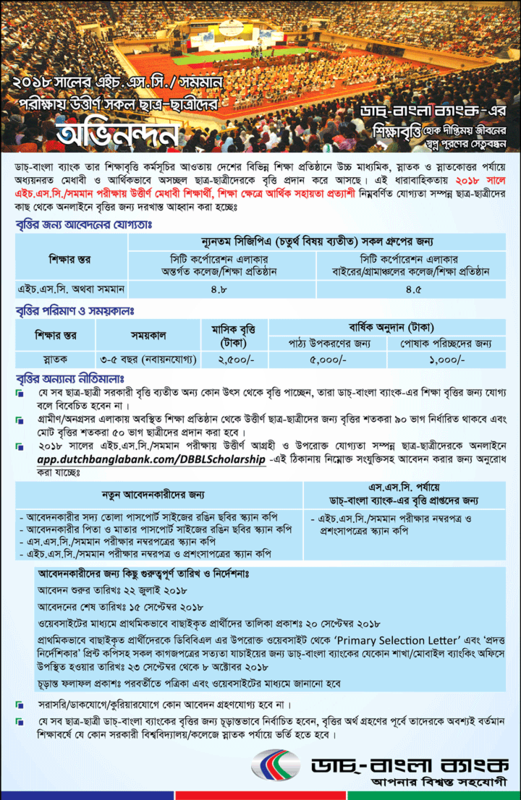 Dutch Bangla Bank Scholarship Result Check, Apply Online, Notice Download. DBBl has published HSC scholarship Circular 2018. They give scholarship HSC. HSC Equivalent pass student every year. Specially they give this scholarship GPA 5 and 4.8 city area students. Application will be start from 25th July 2018 and it will be end in 26th August 2018. After application deadline then they will publish selected students name. Selected students print out Primary Selection Letter and submit your printed letter any DBBL branch. Dutch Bangla Bank supports social work and is one of the largest private donors in Bangladesh. The bank donates towards social awareness programs, medical and educational fields. DBBL has the largest scholarship program in Bangladesh. In 2008, the bank won the Bangladesh Business Awards for being the ‘Best Financial Institution’ mainly for its commitment to technology and community service. Every year they give Scholarship SSC, HSC, Honours and Degree student. They always takes special priority for rural area students. If you are a student of any rural area, you will need only 4.50 GPA. Documents Submission Date: From 23th Sep to 8th Oct 2018. Every students can not apply for DBBL Scholarship 2018. DBBl clearly said their notice, who can apply for this scholarship. Please see below the table, those who are eligible to apply for this scholarship. They must have minimum GPA for this Scholarship. Those who are interested to apply DBBL scholarship, they must be apply by Online. Here we are providing you, how to apply for this scholarship. Please follow instructions below. You must apply by DBBL official website. DBBL Scholarship Result will publish on DBBL official website. They will publish a selection result in 5th June 2018. Dutch Bangla Bank Final result will publish on our website and Newspaper. Please keep bookmark our website for further any information about DBBL scholarship 2018.